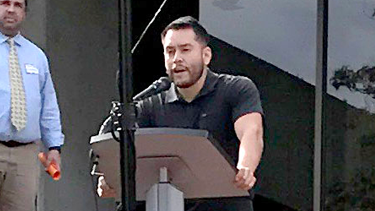 Preston Sanchez, co-director of the UNM Marshall-Brennan Project, introduces co-deans Alfred Mathewson and Sergio Pareja (waiting in the background) to high school students who came to the law school on Constitution Day. For the past four years, the UNM chapter of the Marshall-Brennan Project has celebrated Constitution Day by bringing high school students to the law school to learn more about how the Constitution impacts their lives, as well as the role of lawyers and law schools in promoting Constitutional values. This year, UNM Marshall Brennan Project co-directors Preston Sanchez (Class of 2012) and Matt Bernstein (Class of 2014) brought 80 high school students from West Mesa, South Valley Academy, Valley High School, ACE Leadership Academy, Native American Community Academy (N.A.C.A.) High School, and Siembra Leadership Academy to celebrate Constitution Day on Friday, September 22. 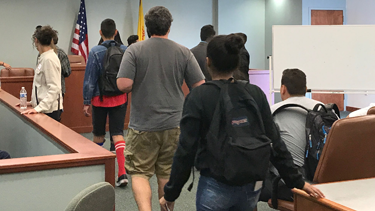 High school students file in to a law school classroom set up as a courtroom to learn about how the Constitution impacts their lives, and the role of lawyers and law schools in promoting Constitutional values. The students also learned about the path to law school and about participating in the 2018 National Marshall-Brennan Moot Court Competition held in Boston, Massachusetts. Christian Tafoya, a student from Valley High School, said it was a “life changing experience” because he got to see how UNM Law students work and the way they are learning to become lawyers. Javier Martinez (Class of 2010), the New Mexico State Representative from District 11, spoke to the students during lunch. The day included a section on Know Your Rights, using the example of automobile police encounters. Students learned that the Fourth Amendment protects their right against unreasonable searches and seizures, and that the Fifth Amendment protects your right not to self-incriminate. After an introduction, a true/false section, and learning the rules, the students engaged in role play where a law school student played the officer. The high school students also toured the law school, and heard from Javier Martinez (Class of 2010), the New Mexico State Representative from District 11, during lunch. Cruz Lopez (Class of ’19), is a Marshall-Brennan teaching fellow in the 3-credit, graded seminar. Cruz Lopez (Class of ’19), a teaching fellow for the Project, says Constitution Day and similar experiences in civics are important.